So often those of us who are gluten free elicit sympathy because we have to eat less than stellar desserts. Or so others think anyway. There are many amazing gluten-free recipes that don’t sell anyone short—whether they are gluten free or not—and this gluten-free Angel Food Cake from Linda, Gluten-Free Homemaker, is one of them. Eat it plain, top it with fruit or maybe a little whipped cream, or even serve it with lemon curd as Linda did for her husband on Father’s Day. Or perhaps you would like to try my personal favorite way of eating this cake … sliced into chunks for dipping in this Chocolate Fondue. I’m not just “waxing poetic” here; I’m speaking from personal experience on this cake and its heavenly fall into chocolate grace! 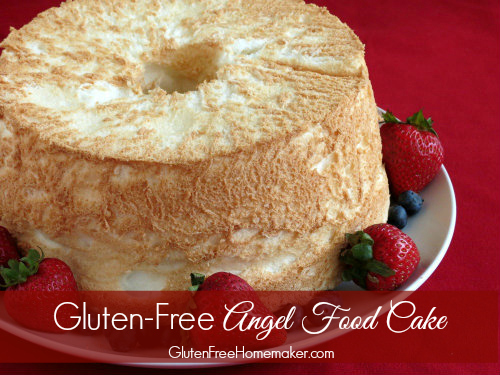 Click the link to get Linda’s gluten-free Angel Food Cake recipe over at The Gluten-Free Homemaker. And have you seen Linda’s ebook, How to Be Gluten Free? It’s a great resource for both those who are new to gluten free or have been living gluten free for a while. Hey Shirley, Do you know if the angel food cake is just as good two days after baking? I would love to make this for my grandmother for her 85th birthday, but I only have time to make it today. B-day celebration is on Tuesday. Do you think it will still work if I do not cut into it and wrap it super well once cooled? I’ve never made an angel food cake before so any help would be appreciated. Hey Melanie–Thanks for the sweet feedback on AGFD! 🙂 How wonderful that you want to make this for your grandmother’s special birthday! I know that we enjoyed this cake the day after Linda made it when she visited this summer and it was every bit as good. Then after everyone left, Son showed up and had his share and flipped over it. He was enjoying it at least two days, maybe three days after Linda made it. So I think you will be fine with your plans! Fingers crossed! And happy birthday to your grandmother! This cake has had its praises sung all week long! I served it at my grandmothers 85th birthday party to a crowd of gluten eating family and friends. They could not believe how delicious it was or the fact that it was gluten free! Literally, this cake has been talked about for three days. Thank you so much for sharing it with us, Shirley! I would have not known about it if you had not posted it here. I’m going to let Linda know how much everyone liked it too! Oh, Melanie, this feedback is simply fantastic! Thank you so much for coming back to share with us all. I told you that cake was amazing! 🙂 I know Linda will be thrilled to hear your and your family’s review! Thank you for sharing Linda’s recipe! I made it yesterday and it’s AMAZING! First time making an Angel Food Cake from scratch and it turned out perfect…so very good. The batter is light as a cloud and it was fun to watch it puff up in the oven and stay beautiful and airy. I used half vanilla and half almond extract and the flavor was perfect. YUM!! Hi Claudia–Welcome to All Gluten-Free Desserts. 🙂 There are lots of folks who can’t or won’t eat xanthan gum, and there lots of different substitutes. I think that subbing for the gum in a cake like this one might prove difficult. You might try Dr. Jean Layton’s Pixie Dust xanthan gum replacer. It’s a mix of flax seeds, chia seeds, and psyllium husk powder. You make it yourself. You can find the recipe here. Of course, I really have no idea if this gum replacement will work in this recipe. You will have to do some experimenting and you might want to try the replacement first in another recipe that requires less ingredients and less effort like a cookie recipe to see if you like the results. Good luck!